Everyone loves a good secret. I’m here to share some of Mattermark’s unintentional best kept secrets to make your prospecting or research more fruitful. Here are five ways you’re likely not currently using Mattermark, but should be. 1. Directly compare two companies side-by-side. When identifying your target companies or researching competitors in your own market, you can compare companies to decide priority of outbounding or to simply learn more about target companies. Check out the comparison of DJI and GoPro, two companies that produce consumer handheld drones. 2. Get to know up-and-coming startups. Looking for brand new companies that are just starting out? Look no further than our “Accelerator Batches” lists, found under the “Research” tab in our web app. You’ll be able to see breakdowns by industry, business model and stage. Find companies you want to track, follow them individually or follow the entire portfolio. 3. Keep a pulse on companies you care about. If you’re not using your Mattermark News Feed, you should immediately set it up. News Feed is not solely an article aggregator for companies you’ve clicked “Follow” on. 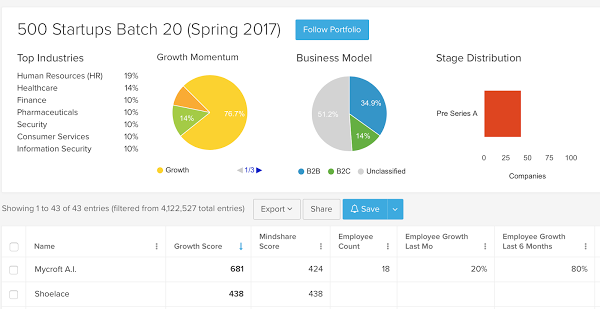 You’ll also be able to see which of your companies’ Growth Scores have increased week by week. If you’re not following companies, you’re missing out on a new way to track your leads, targets or favorite companies, like the ones below. 4. Follow portfolios and find your next investor. Raising a round? Deep dive into our investor portfolios, and get to know venture firms to reach out to. You can learn about companies they’ve invested in — from industry to location to employee count — to see if your company aligns with its portfolio. 5. Customize the companies you track with custom lists. First off, these are not our saved searches. They are up to you to create. Do you have a list of companies that span different locations, industries or revenue ranges? Create a new list and paste in the website domains for each company to see Mattermark’s data for these companies in one place. This is THE no. 1 tool you’re not using and definitely should be. From there, you can compare and follow companies and more. It’s time to power up your Mattermark experience with these insightful tools built into the platform. Compare, contrast, and get real-time insights on companies you care about and find new ones you should be focusing on. Seeing something you want to explore but don’t have a Mattermark account yet? Sign up for a free 14-day trial and get to know companies that are on your radar.